Does your 1979-1993 Mustang have a broken outer door handle? Replace it with this high quality LH Ford replacement door handle! Replace your broken outer door handle with this Ford original for 1979-1993 Mustang! The factory handles become brittle over the years and eventually they break when you open the door. This Ford original is a direct replacement for your original. This handle fits the driver's side and is made out of plastic with a black painted finish. Get these original Ford parts before they're gone! Broken Outer Door Handles on Fox Body Mustangs are a common problem. Nothing is worse than not being able to open your Mustang door! Follow along in the video as Jmac shows you how to replace/install/remove your Mustang door handles. 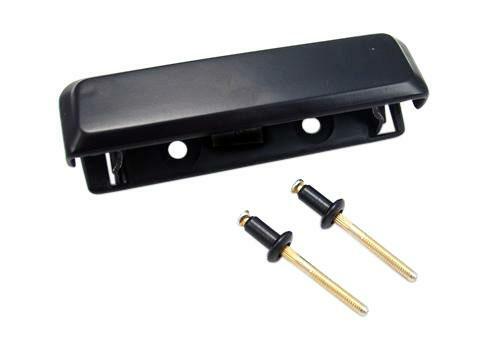 This is a driver and passenger side outer door handle kit for your 1979-1993 Mustang. The original door handles on the later Fox Mustangs were made from plastic and commonly tend to break over time. Our new replacement door handles are made from metal instead of plastic for a long lasting fix for your Mustang. This door handle kit comes with a black painted finish and ready to be installed. Use only 5.0Resto Mustang parts on your Project Fox Body Mustang!! !